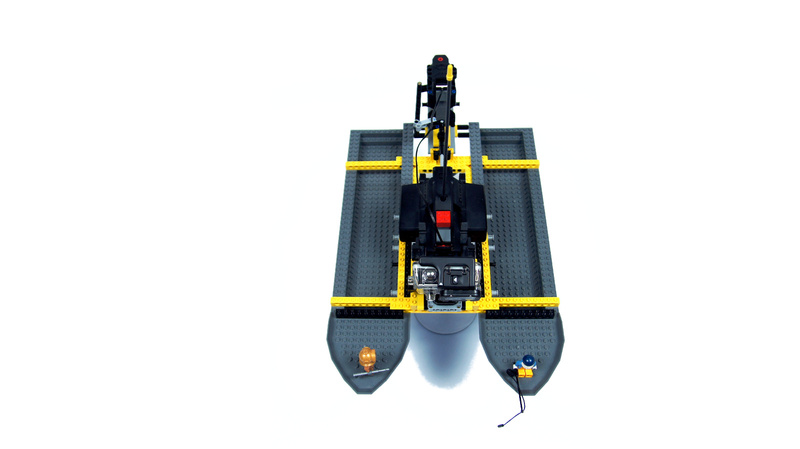 Fast, camera-equipped boat with unique propeller. 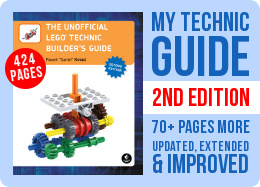 Features my first rudder control system. 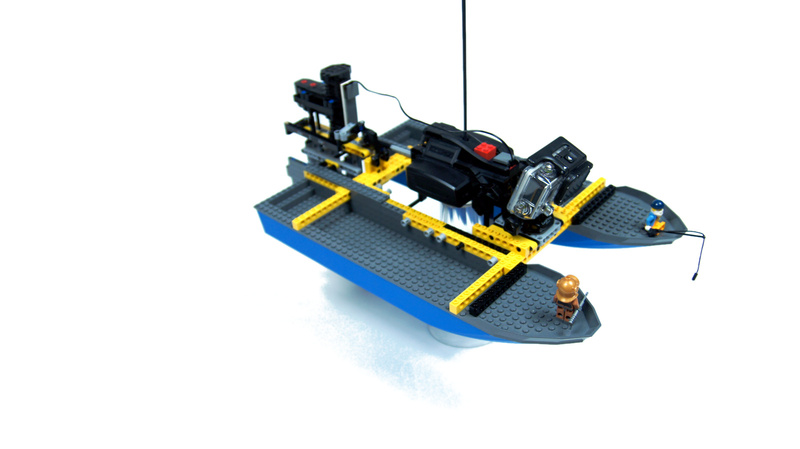 The main problem that arises when one tries to build a relatively fast LEGO boat is the propeller. 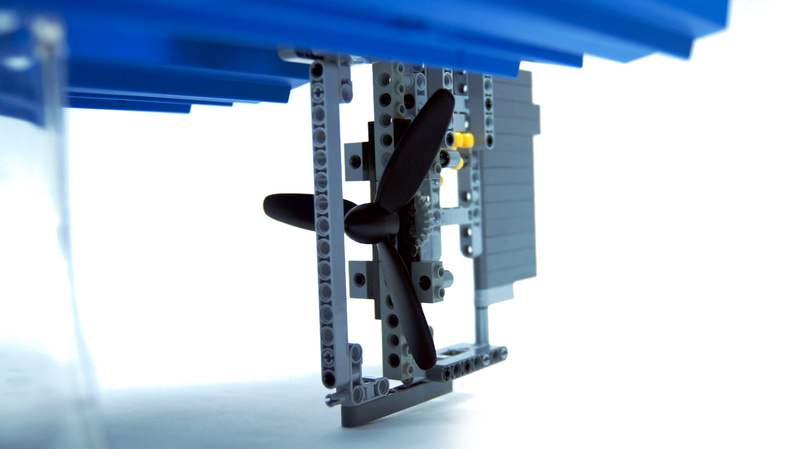 Most existing LEGO propellers are either very small, or have profile that is completely unsuited for water. 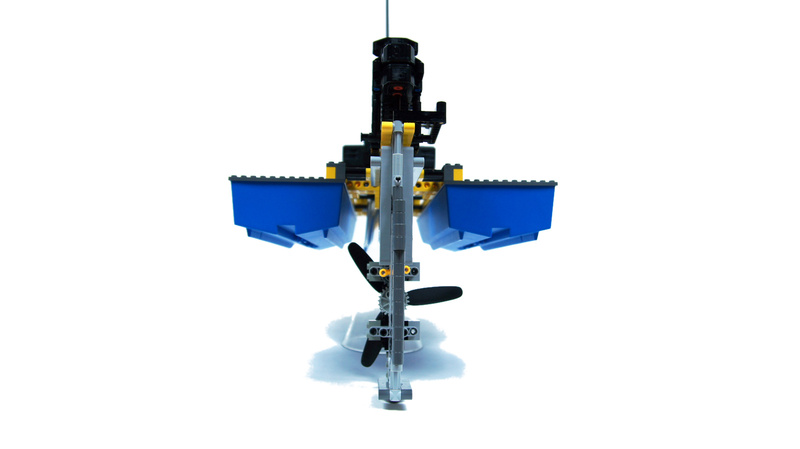 However, back in 1988 LEGO has released the 8855 Prop Plane set, including a very unique propeller, which was large and had a very good aerodynamic profile, and which was never used in any other set again. Once I’ve finally came across one such propeller, I decided to try to use it with a boat. First tests have shown that the propeller is indeed quite effective, but it also has asymmetrical blade profile, meaning that it’s more effective facing forward (like in a typical plane) than facing backward (like in a typical boat). This called for an unusual design, with the propeller turned the opposite way to how it’s usually oriented. I decided that for stability and good exposition of the forward-facing propeller a double-hull design in form of a catamaran is optimal, and I have used two 51×12 hulls as a base for the boat. The orientation of the propeller, which was fully exposed between the two hulls, called for some kind of protection from collisions and minor objects in water, so I have installed it inside a large, central fin mounted at the back of the boat, between the hulls. On top of the fin there were both propulsion motors, and its back served as a base for a huge rudder made of beams, which was connected to the RC unit’s steering output. 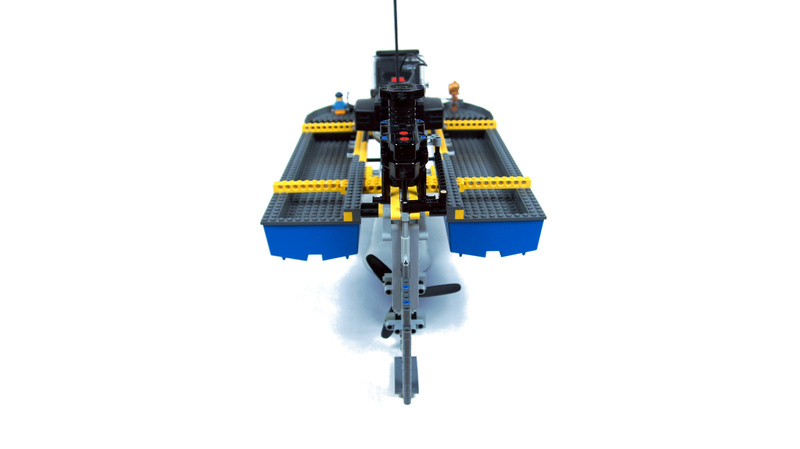 This provided a powerful propulsion system and an accurate return-to-center steering with just two motors and the unit. 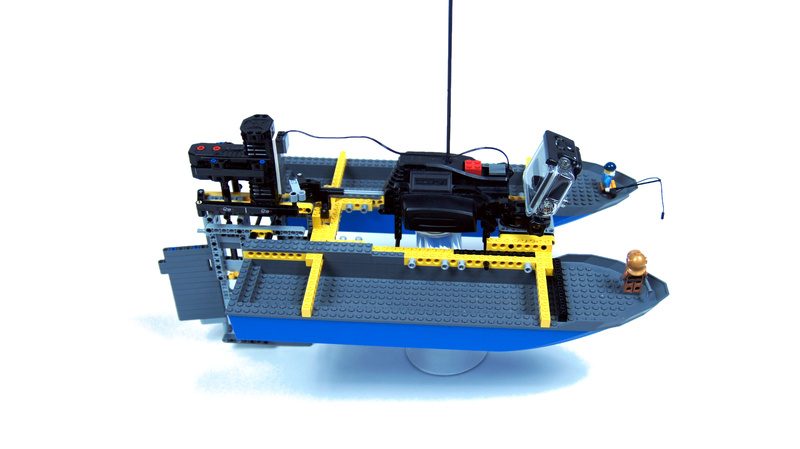 The boat provided reasonably stable during testing. I had to move the RC unit forward though, because the sterns, which were lower than the bows, had a tendency to take on some water when accelerating. 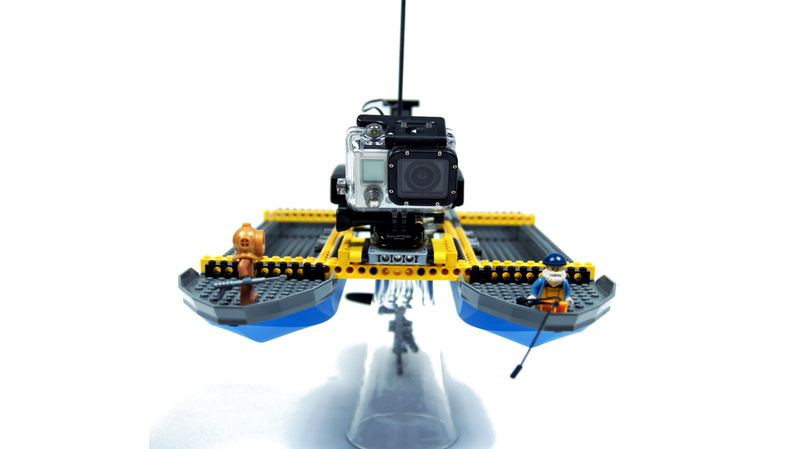 This resulted in a very limited space on the bow, which blocked my plan on mounting the GoPro camera on a turntable rotated remotely with an additional motor. I have ended up with the camera fixed in a forward position. 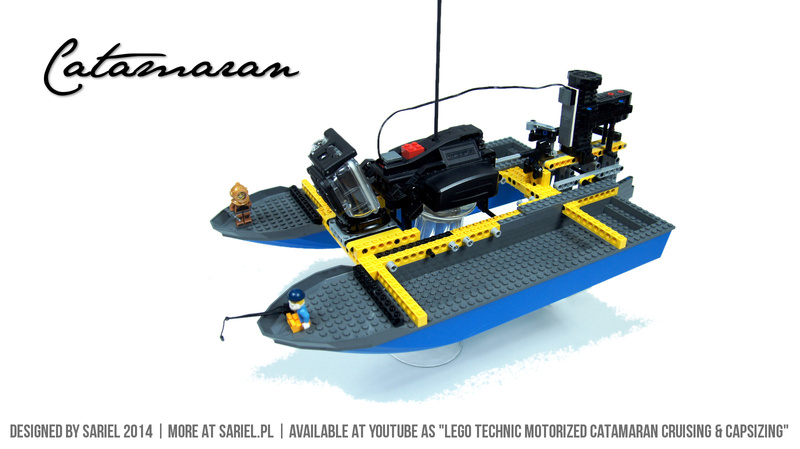 The Catamaran performed very well out on a lake, with great stability, very accurate steering and impressive acceleration – the top speed was lower than I hoped for, though. It worked so flawlessly, that I dared to depart around 10 meters away from the shore, and the RC unit was still in range. Problems appeared only when I moved the GoPro to the stern, installing it on a side, which made the boat list to that side. I thought the listing was acceptable, but I was proved wrong when after a short cruise the boat slowly capsized. Luckily, it remained afloat and the water was fairly shallow in that spot, allowing me to wade into the lake and pull the boat out manually. It was a nice model to play with, but I had some concerns about the large propeller and the central fin, which reached deep into water. There was a large chance of colliding with some underwater objects and getting stuck. Which is why my next vessel will probably be an airboat. Yes, but you are talking about surface-piercing propellers. They have special shape to work that way, and they are only efficient at very specific speeds. 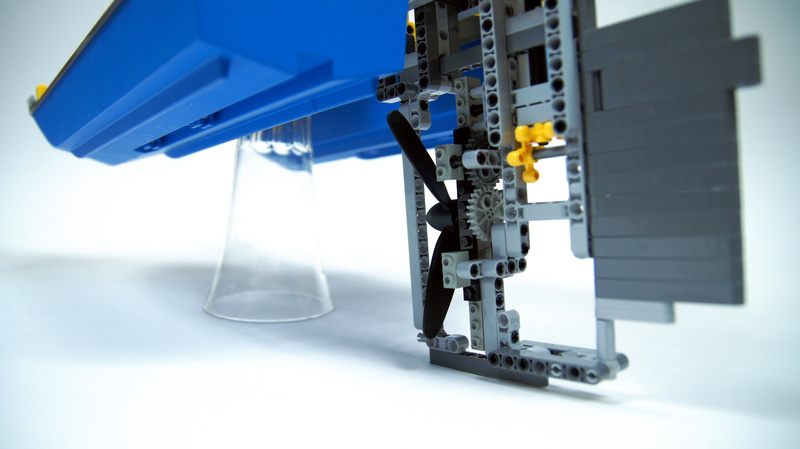 I strongly suspect that a standard propeller, such as LEGO’s, will only provide half of the thrust when half-submerged. Perhaps if you were looking for more speed you could move the propeller up so it is half-in, half-out of the water? They use this in real racing boats for more speed, and this would also decrease the drag of the fin by half. when it capsized, did the RC motors still work after? Also, how many RC units do you have?!?! All the components are original. 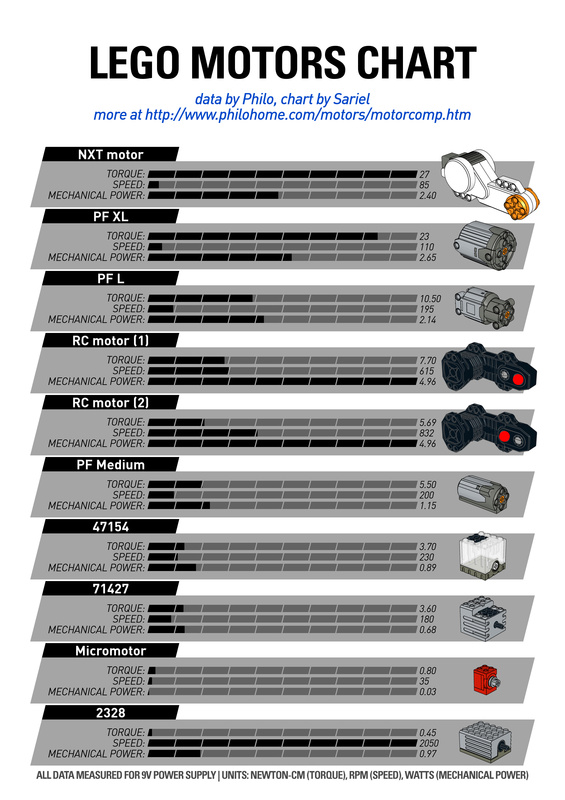 Perhaps you have some electric problem or you’re putting too much load on the motors. Hello Sariel, the RC components are original? 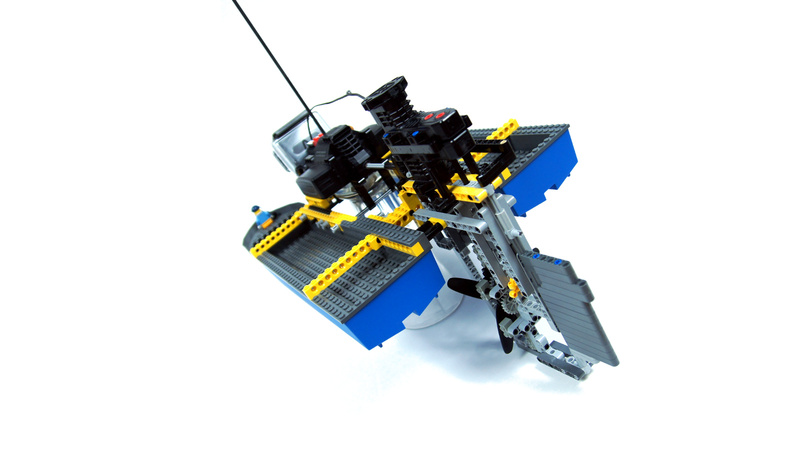 I tried to build something with this configuration (one RC reciver and two RC motors), but it doesn’t work, or rather, they only work for a few seconds or discontinuously. Any advice? Thanks! The stern got too low and took some water on top of it. What happened to cause it to capsize – water in one of the hulls? I doubt that, the motors were working hard already. With that much torque on the driveshaft would I estimate it to accelerate by gearing up propeller’s RPM? Because two RC motors have twice the power of one RC motor? Also, I can’t have two propellers like this because they’re asymmetrical. Which means that both would have to rotate in the same direction, and that would make the boat unstable. I think if you put two boat hulls back-to-back and then had two sets of those [four in total] as your catamarans, you’d be solid. 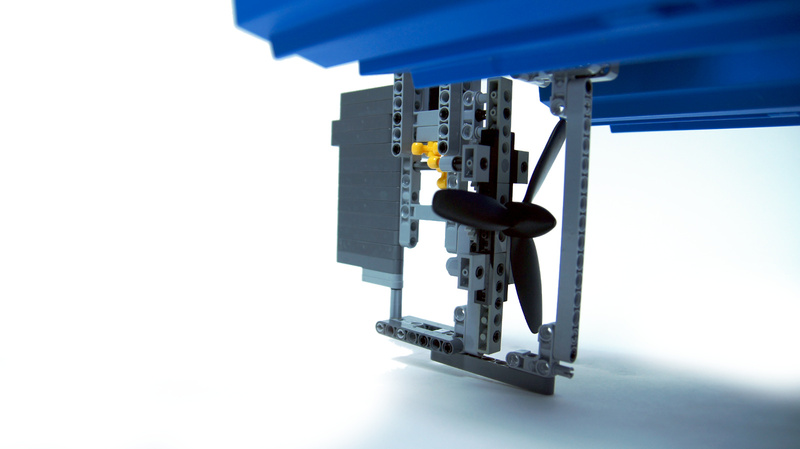 Why do you need both RC motors for just one propeller? I’d also go for another propeller of the type you’re already using, with one RC motor per propeller… unless the propeller requires that much power! I dried them, but they will probably rust eventually. 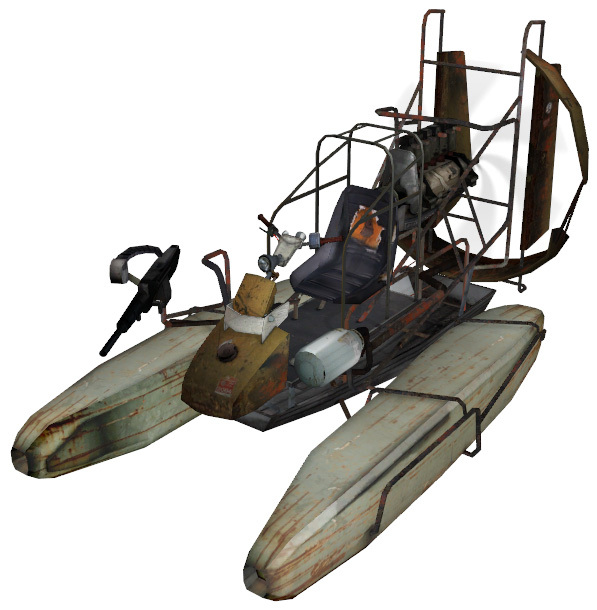 I know HF2 airboat, but mine will look different. This gear is part of the propeller, you can’t detach it. Also, what’s the unusual looking gear that has the propeller attached to it? I’ve never seen it before. 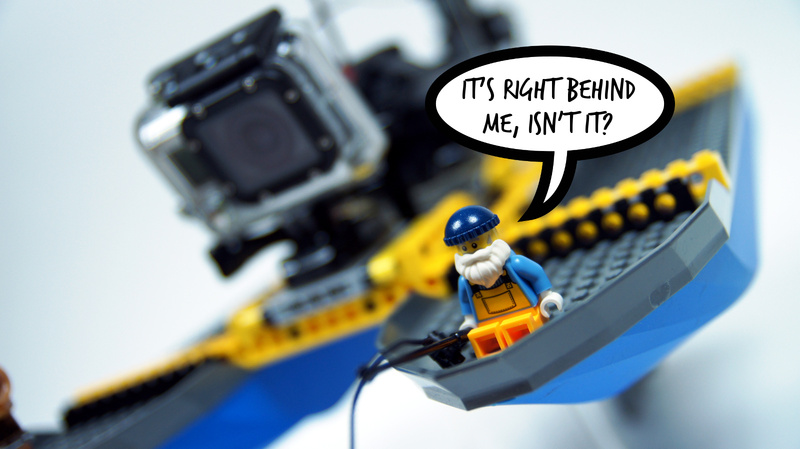 You are a BRAVE man to expand the limits of Lego RC craft! 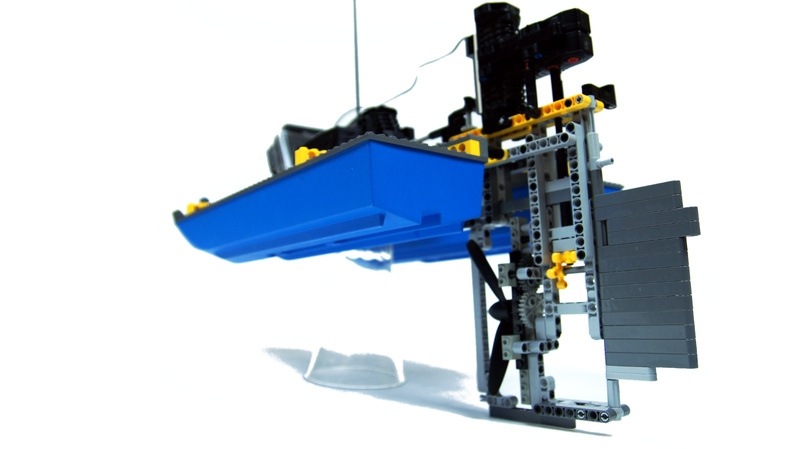 Were your motors ruined by capsizing, or could you dry them out for future reuse?